InterConnections 21 is committed to improving our sustainability efforts at our annual Teton County Model United Nations (TCMUN) conference and throughout our operations. Our location in one of the greatest intact ecosystems in the U.S. has inspired us to reduce our environmental footprint and share our efforts with all of our program participants. –Eliminate waste at its source by purchasing products with little or no packaging. –Purchase materials that are reusable, recyclable, and compostable. 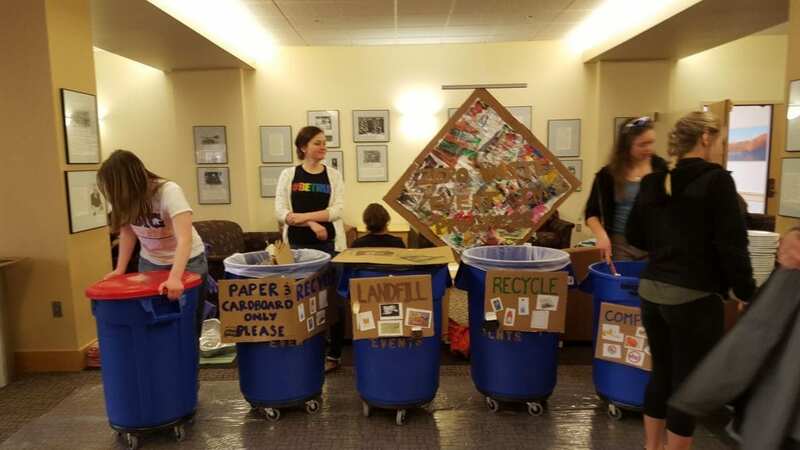 –Train staff and volunteers on sustainable practices, including separating recycling and trash waste and educating conference participants. –Create and become familiar with an emergency response plan. –Request that food donors and vendors provide services and products that support TCMUN’s sustainability goals. –Increase the amount of local food, fair trade, and organic foods that are served. –Work with local farms in order to compost food waste. –Encourage participants to choose their own portion sizes to reduce food waste. –Reduce disposable and non-recyclable materials/handouts given to participants. –Provide reusable plates, glasses, and silverware rather than disposable counterparts. –Provide recycling containers next to waste containers in every room. –Promote recycling habits through easy-to-read signage at all waste stations. –Encourage participants to bring reusable water bottles to be refilled at water fountains in the school. –Determine event waste baselines by weight and/or volume. –Measure total carbon footprint of events. –Encourage event staff and volunteers to reduce water consumption when washing dishes. –Inform all TCMUN participants about sustainability initiatives prior to the conference and encourage participation during the conference. –Promote Teton County ISWR’s Green Event status on radio, website, Facebook, and event promotional materials. –Encourage carpooling, biking, and taking the bus to reduce solo vehicle trips. –Meet with school clubs in order to increase outreach to underrepresented students. –Increase promotions of other local nonprofits sponsoring TCMUN. –Promote free keynote speaker community event to increase community outreach and involvement. “IC21 gave me the important gift of learning how to better understand the world in which we live while developing my leadership, public speaking, and writing skills. Through participating in Model United Nations with IC21, I learned to listen with curiosity, to stay open-minded and humble, and to sift through the evidence as presented. I have learned that the nations and people of our world resist easy explanation and that an engagement in my local community translates to the ability to begin a exploration of a world beyond Jackson, Wyoming, the States and my own culture.